The Theme for this year’s Conference is ” Unleash The Power of Project Management of a better Tomorrow “. organized by PMI India along with PMI TEAM INDIA (7 PMI chapters of India) hosted by Pearl City Chapter, Hyderabad. PMI creates history in Showcasing the best Projects in the Indian Subcontinent and the convergence of best of talent to share the cutting edge practices in Project Management. Of the 12000 certified Project Management Professionals from India, the conference has a foot fall of more than 700 of them at the Venue which is a very impressive number. The Name badges had different color bands to indicate the Project Management Qualification of each delegate thus facilitating breakout conversations among the peer group. Anything @ HICC is a pompous affair and PMI PMC was no exception. Starting with the traditional Kuthuvilakku (lighting of Lamp) by the distinguished chair and political blessings from the honorable Chief Minister Shri Rosaiah, it had all the making of Showcasing what India is all about to the distinguished global audience. Welcoming the delegates, Mr Raj Kalady, Managing Director PMI India was all praise for the “awesomeness” of the Event.PMI India team drives excellent coordination between volunteers of 7 different Chapters to ensure that the pre event coverage is extensive across industry and Project Management practitioners. In-spite of their day jobs all the volunteers draw synergy to make this event a grandiose success . Mr Steven Fahrenkrog, VP, PMI USA recalled his Indian experience . Vote of thanks was delivered by Mr Suresh Chandra, President PMI Pearl City Chapter thanking the 7 coordinating chapters for the success of the event. As soon as I came to the venue I met with Mr Arun Kiran Ponnekanti, who heads Corporate communications and Brand Management for PMI PMC. After a 10 minute discussion we got to work on updating the Social Media tools like Twitter ( #PMIPMC ), Facebook and Youtube with minute by minute live updates. Incidentally i am at the HICC at the same place exactly a year ago (2008). I was invited by NiXi(National Internet Exchange of India) as a Internet Governance Research Fellow to IGF 2008 and here i am a year later as part of PMP sharing notes with the peer group. 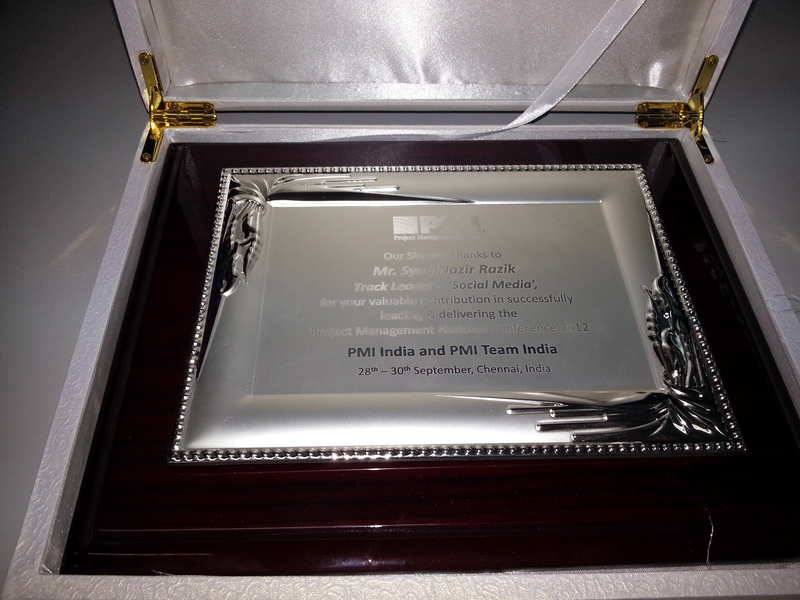 Look forward to 2 more exciting days with PMI Team India. Good Nite folks !